Drug use can cause you to lose your ability to remember things, to think clearly and to study properly. Drug use gives you the impression that you are more alert and aware, but under the influence of drugs you are actually less aware, and less alert. Drug use can also cause people to act in strange unpredictable ways. 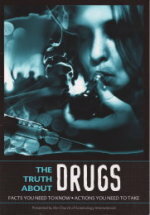 A person can undergo a complete personality change when under the influence of drugs. Since drug residues can remain in the body for many years after they were taken, the effect on the mind can last a long time. Don't lose your mind! Avoid drugs. Drug use can make you ill and an overdose can kill. Drugs are poisons after all. The list of diseases you can catch as a result of using drugs is very long and includes Hepatitis C, HIV and AIDS. Since drugs also use up your body's supply of vitamins and minerals, you become more prone to diseases. Many drug users suffer from malnutrition as a result of their habit. Why be a loser? Stay healthy! Drug use interferes with your ability, which can make it harder to earn money. In the long run, the more competent a person is in a job, the more likely that such a person will earn a higher salary. However a person under the influence of drugs is quite likely to make expensive mistakes and be incompetent. That is unemployment waiting to happen. Also, a drug habit can be REALLY expensive (up to hundreds of pounds per day!) and this is why many addicts are forced into crime. Don't waste your money. Drugs are the ultimate betrayer - you pay big money to destroy yourself. Anyone convicted of drugs offences will not be allowed entrance into some countries such as Japan, Canada and USA. Why lose exciting opportunities to travel? Why limit your options as to where you want to work & live? Many people like to work abroad, particularly in the USA, for a time during their career. This would be impossible with a criminal record. Drug use that seems a "cool" idea in the beginning can turn into a living nightmare that includes accidents, hospitalisation, a life of crime, a criminal record, hurting those you love, destroyed relationships, a prison sentence and death. Drug users often lose their enthusiasm for life, give up sports and hobbies etc, in their fixation on the next score for their habit. Taking drugs definitely gives you a new lifestyle, but it is the lifestyle of a sad loser with no prospects. Many drugs are grown in Third World countries. The drug barons involved cut down forests for space to grow the drugs, thus destroying the natural habitat for thousands of creatures and upsetting the ecological balance. It is true that natural forests are cut down for constructive reasons by legitimate companies, but there are laws in place which compel those companies to plant new forest as replacements. Drug criminals, needless to say, ignore these and all other laws. Buying and taking drugs encourages more natural forest to be destroyed. Criminals manufacture and sell drugs. They do not care what effects the drugs have on their victims; they are only interested in the money. These criminals terrorise ordinary people and society, using violence against anyone who tries to stop them. These criminals establish a social environment where there is no respect for law & order, only respect for violence. This generates fear, suspicion and misery in our communities. This destabilises society and could lead to its disintegration. Buying and taking drugs supports this criminal infrastructure. 8. Drugs mess with your love life and fertility. There is evidence that abuse of drugs can lead to impotence in males. Certainly, abuse of drugs in females can affect unborn children, with the babies of drug addicts far more likely to be underweight and to suffer from birth complications. The damage that drug use can do to one's physical appearance is very obvious. 9. Drugs mess with your hopes and dreams. Drug addicts, when craving their next fix, often do not care about anything other than the immediate high demanded. All other considerations, every aspect of normal human behaviour are ignored in this compulsion. Everyone has hopes and dreams for the future, but for addicts those hopes and dreams only focus down to where the next score is coming from. Hopes and dreams for the future? Only despair and nightmare for addicts. © 2004-2016 Church of Scientology United Kingdom. All Rights Reserved.